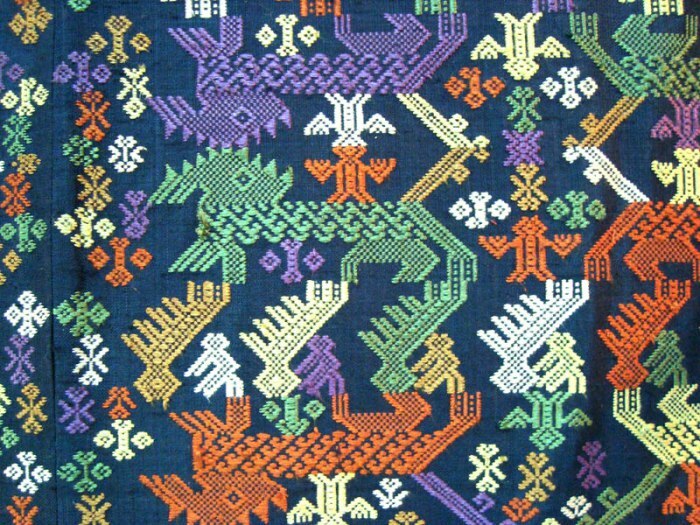 The best SE Asian Textile Tour! You’ll be met in Bangkok on June 15 at the airport, and we’ll all fly home from Siem Reap (REP) on July 4. More flight info later. Go Behind-the-Scenes to a fabulous festival in little-known northern Thailand. See the superb UNESCO site of Angkor Wat in Cambodia, and the golden Buddhist temples of Luang Prabang, Laos. 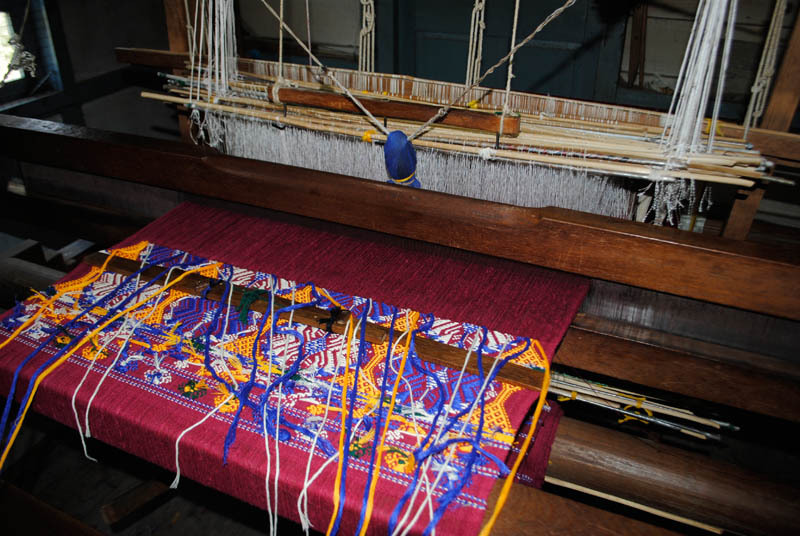 This is more than a textile tour, but there will be plenty of textiles: We’ll watch weavers at work, and learn how they tie and dye threads to create exquisite ikat patterned fabric in both silk and cotton. 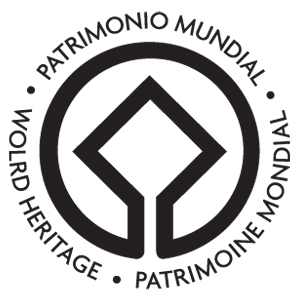 We travel in a big loop, seeing the best of all three countries — the most interesting textiles, architecture, archeology and culture — including three UNESCO World Heritage sites. Weaving with a complex system of pattern-keeping. TRIP DETAILS: We’ll first go to the Phi Ta Khon Festival, in a little Thai village known for its raucous parade of fabulously masked dancers. Phi Ta Khon, means “Ghosts Following People,” and the celebration commemorates a joyful event in young Buddha’s life, as a prince. Dancers create sensational costumes and masks, and cavort with phallus-shaped swords, related to the fertility emphasis of the festival. Afterwards we’ll drive to Vientaine, Laos, then fly into Luang Prabang to see the ancient royal capital, now designated a UNESCO Heritage site. We will visit important Buddhist temples, and you’ll be able to explore this laid-back and friendly town on your own. 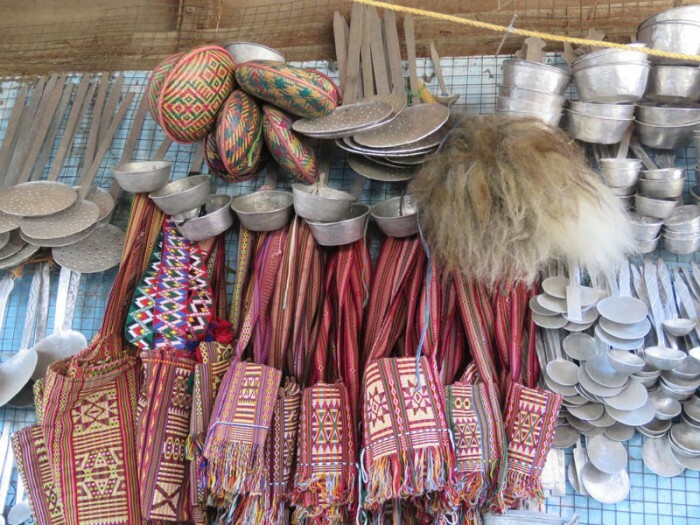 Time to soak up the tranquil, tropical ambiance: we will spend the afternoon at the textile center of Ock Pop Tok where we’ll make natural dyes and dye silk scarves, and also watch talented silk weavers. Dinner by the Mekong; see if you are brave enough to try the spicy fermented water buffalo skin condiment! The fried river moss is delicious. The local market is interesting, and nearby there is an excellent new textile museum and shop. You can try shopping at the Night Market with all its handicrafts and art; although it is getting rather commercialized, there are still some interesting things to be found. Along with the magnificently decorated temples, a significant part of the old town’s appeal is the many French provincial style houses, the riverside location, and the tropical ambiance—Luang Prabang is a delightful place to relax and learn about Lao culture. 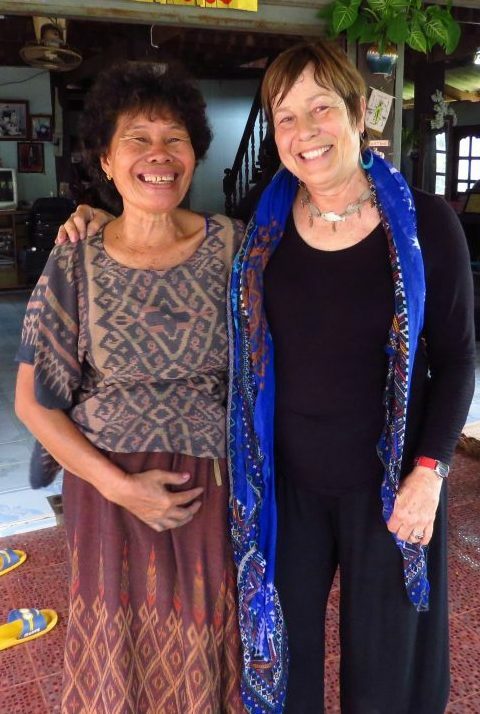 Then we fly south to the pleasant riverside capital of Laos – Vientiane – where we’ll visit the enormous textile/fabric market, and meet the weavers in a nearby weaving village with a Laotian friend. We’ll also tour an innovative silk weaving studio, and see the the famous Wat Si Saket with its 10,000 Buddhas. 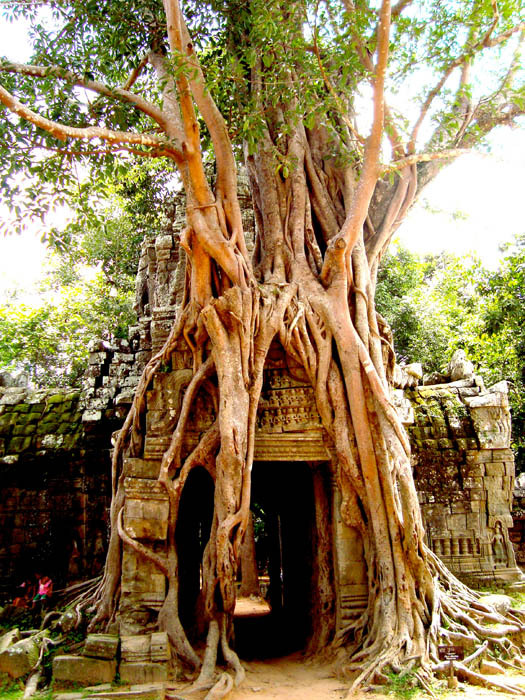 One of many overgrown temples at Angkor. 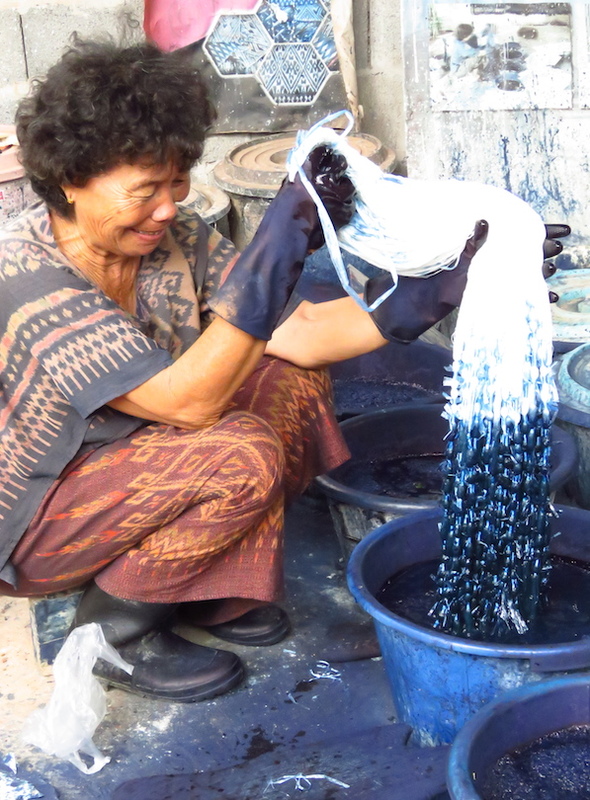 In Udon Thani we’ll visit delightful friends who dye natural cotton with natural indigo and use fermented fruits in the dye bath. We’ll see the entire process from tying and dyeing the weft, to weaving the cloth. Continuing south, we’ll visit the important ikat (mud-mee) silk weaving town of Chonnabot and marvel at the hundreds of intricate, historical resist-dyed silk in the Silk Museum there. 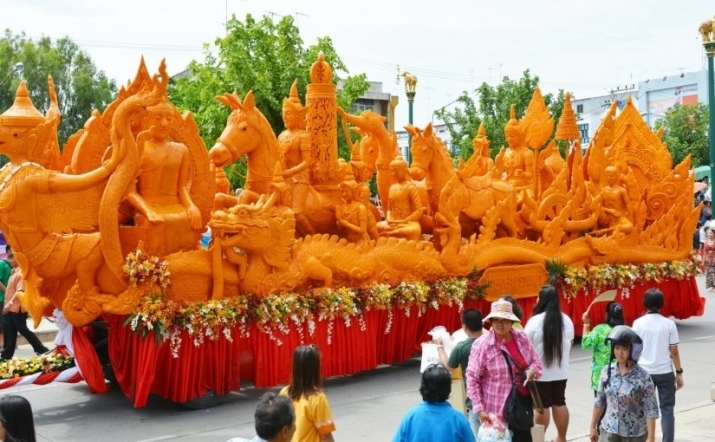 Next stop is the riverside town of Ubon Ratchathani, known for the fabulous Wax Candle Festival or Khao Phansa. 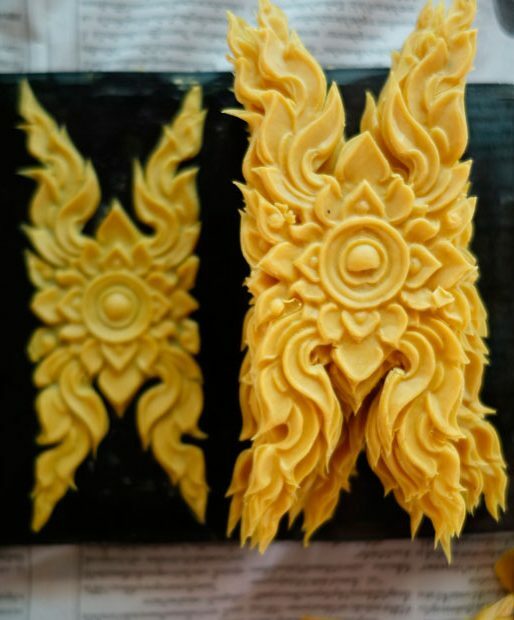 We’ll visit friends who will show us the incredible wax floats they are preparing for the event next month; you can even make Buddhist merit by cutting around some of the wax shapes to decorate the floats! Then we head south by van, into Cambodia, to Siem Reap and the fabulous Khmer temples of Angkor Wat! A UNESCO Heritage site, Angkor Wat and the surrounding wats form a world-class temple complex, with sophisticated wall carvings. 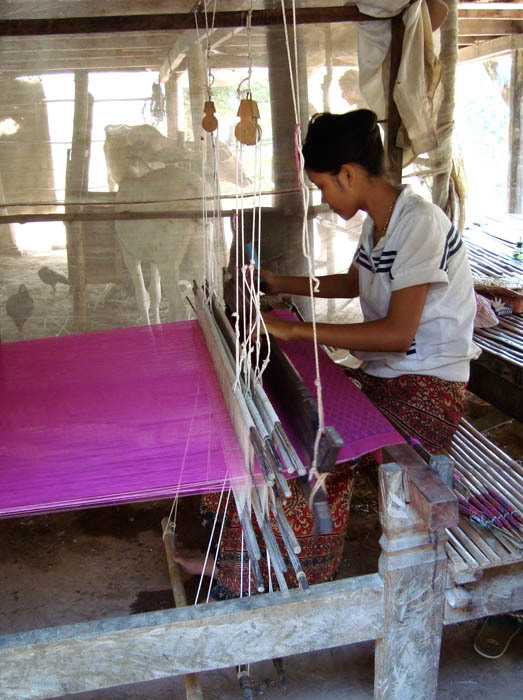 Cambodia also has some of the most intricate silk weaving anywhere in the world. We’ll go out of town to visit the premier silkworm breeding and silk reeling facility, then watch the weavers here to see how different their techniques are from the Thai and Lao silk mat-mi artisans. We’ll stay 5 nights in this lovely hotel in Siem Reap, with refreshing pool (above) and have an optional hands-on cooking class to learn the subtleties of delicious Cambodian cuisine (similar to Thai). We’ll also visit a fascinating, large, commercial but relaxed silkworm breeding and reeling facility, and watch the weavers work. Our Farewell Dinner will be followed by a performance of Phare, the renowned Cambodian youth circus – no animals – but great acrobatics! 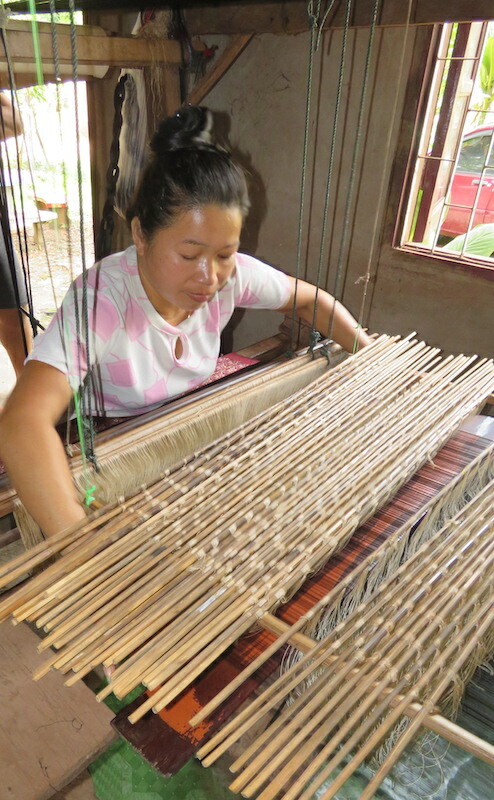 Supplementary weft piece of silk weaving, Laos. Minimum 6, maximum 12 travelers. Includes 19 nights in comfortable A/C hotels in double/twin rooms (a couple of the hotels have a pool), all meals except three lunches and two dinners in Siem Reap and Luang Prabang on days when the group is scattered (we will suggest possible places to eat), all soft drinks and bottled water with meals, round-trip flights from Luang Prabang to Vientiane, all in-country travel by private van with professional driver, three days of entrance fees at Angkor Wat, all transportation in the Park, entrance to the archaeological and museum sites on the itinerary, a Cambodian cooking class at an excellent restaurant in Siem Reap, the Phare Circus show and dinner, and an 8″ x 11″ photo book documenting your trip! Fly into Bangkok, and home from Siem Reap. 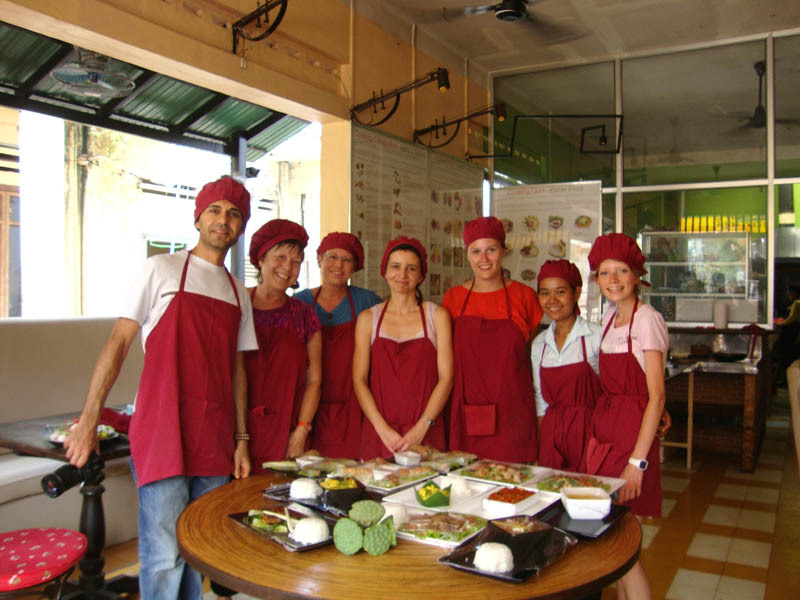 Cambodian Cooking class in Siem Reap. Not included: International airfare, airport departure transportation, alcoholic beverages, several meals as indicated on itinerary, personal items such as laundry charges, luggage porter tips and between-meal snacks and drinks. A generous tip per person for the Angkor guide and the van driver(s) has already been added to the trip cost, so you don’t have to worry about tipping! Stack of wax decorations ready to adorn float figures. Anyone who helps transport your bag should be tipped the local equivalent of about $1 per bag. 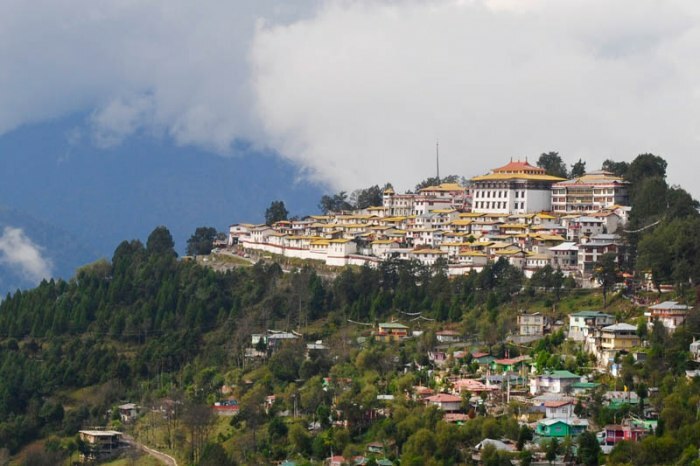 Six-hundred year old Tawang monastery built when this region was part of Tibet. Northeastern India remains the least-visited and least-populated region of the country — and the most traditional. 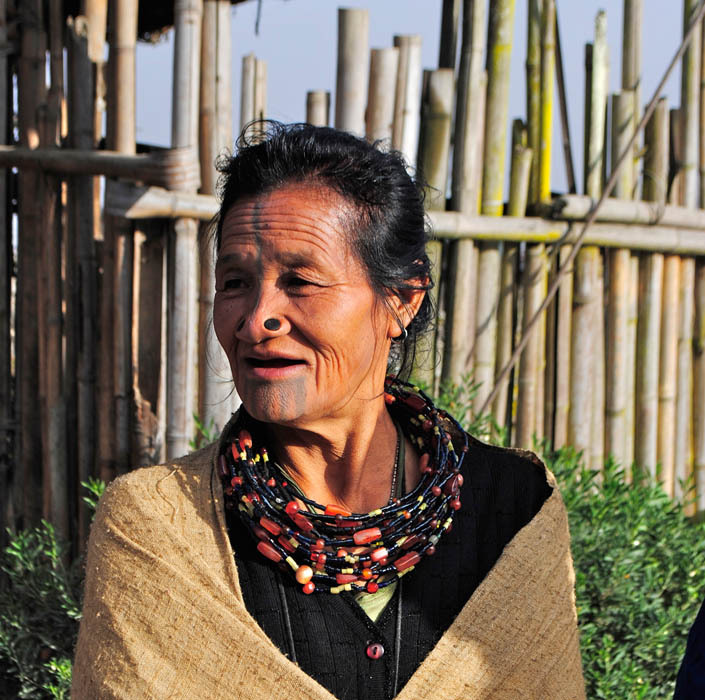 In the seven northeastern states, over 200 ethnic groups speak as many dialects; this diversity is reflected in the clothing, architecture, and traditional arts and crafts. 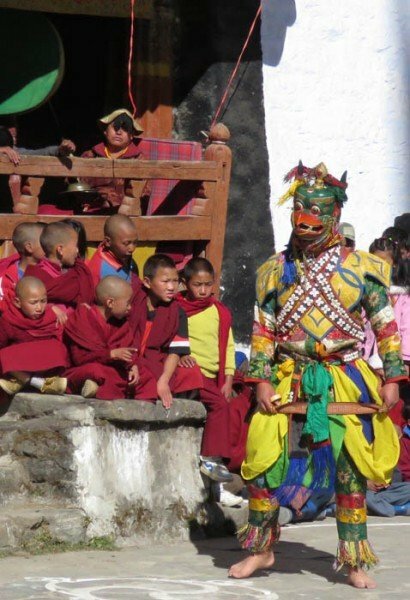 Highlights of this 20-night adventure include an exciting three-day Buddhist festival at the huge Tawang monastery; spectacular mountain and jungle scenery, silk weavers in Dirang and Biswanath Ghat, several superb Hindu temple experiences, and visits to friends’ families of Apatani people in Ziro Valley. After being on land for almost two weeks, we’ll board a fine new riverboat as transportation for the remaining days: to visit Kaziranga National Park, Majuli Island, and the mask makers there; tea plantations, and silk weaving villages. 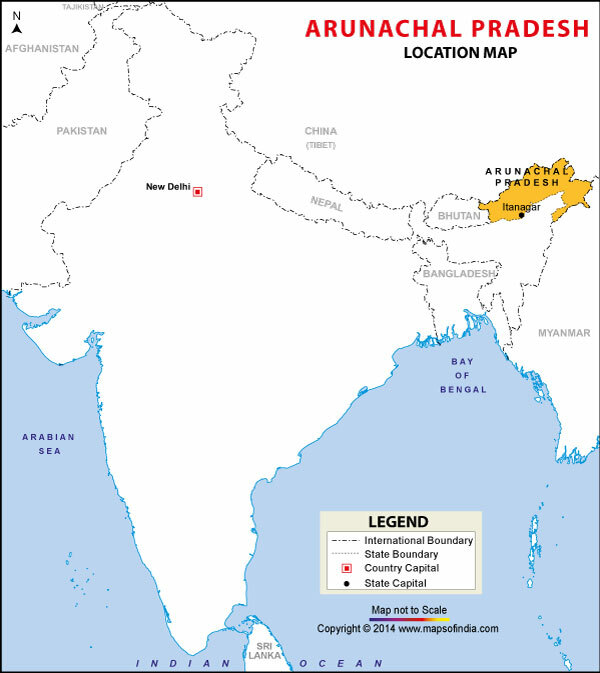 We will be traveling in the states of Assam and Arunachal Pradesh, location map below. This area is very different from the rest of India! Photo gallery with more images here. 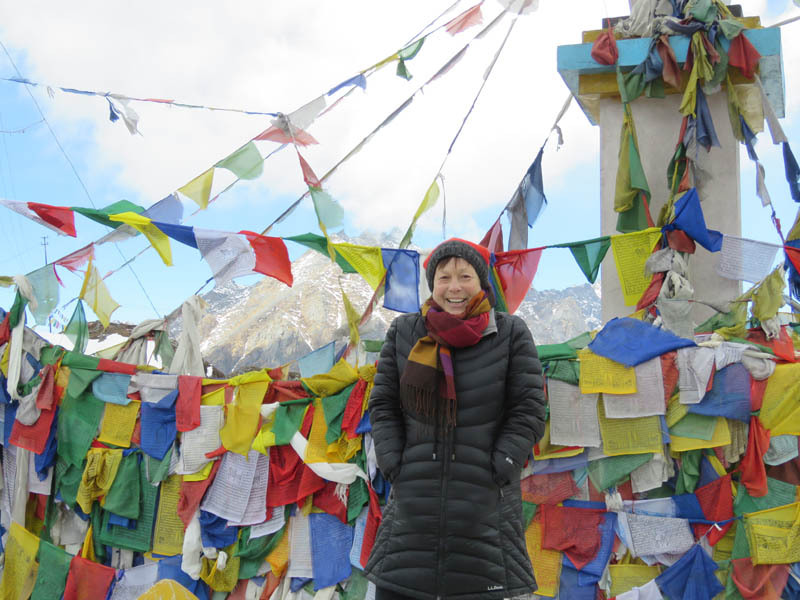 Cynthia at SeLa Pass with prayer flags. Details: We’ll start out in Delhi, check into the hotel any time after 12 noon, for the night. Then we’ll see a bit of Delhi before we fly to Dibrugarh on the banks of the Brahmaputra River (state of Assam), meet our wonderful guide and the three drivers, and visit the local market. Cross the Brahmaputra River on a ferry, then visit a Nyishi village. Our English-speaking expert guide and one driver are from the Nyishi ethnic group so these village visits are full of fun and photo ops! Continuing on, with special ‘Inner Line Permits’ in hand, we cross into Arunchal Pradesh and drive north to to the beautiful Ziro Valley, home of fascinating indigenous cultures who worship the Sun and the Moon –a religion called Donyi-Polo. We know many families here and we’ll be welcomed to village homes, meeting mothers and grandmothers with the nose plugs typical of the Apatani people. Traditional dinner with the guide’s family. Next we drive to Nameri National Park and spend the night in comfortable tents at an Eco-Camp, surrounded by tropical plants and birds. Then we’ll continue to Dirang where Monpa silk weavers make red jackets patterned with colorful cotton supplementary weft. Our wonderful guide is a serious bird-watcher and he loves to photograph them whenever possible. There will be an (optional) early morning bird-watching foray to see Black-Necked Cranes in the valley here. Our route progresses from lowland agricultural valleys to pine forest highlands, then we arrive at starkly beautiful Sela Pass at 13,700 feet. After the pass, we descend on the winding mountain road to Tawang situated at almost 10,000 feet in the Himalayan foothills, site of the huge and impressive monastery — and venue for the festival. 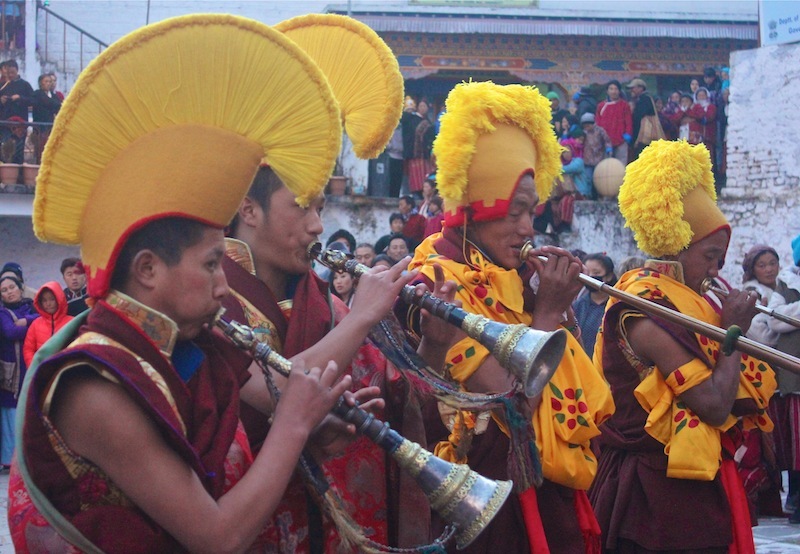 To fully experience the festival and this lively and spiritual town, we will spend several nights in Tawang, taking time also to visit the big monastery with its enormous Buddha, a nearby nunnery which welcomes visitors, another incredible monastery with intricate mural-painted walls, and the Tawang town market. The guide speaks several indigenous languages, and can relay questions to the people we meet. 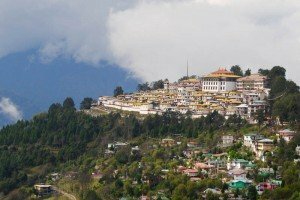 Tawang is about twenty miles from the Tibetan and Bhutanese borders, in forested foothills of the Himalayas. After the festival, we return to Dirang over winding roads following the tropical hills and valleys. Banana trees, rice fields, and tropical foliage are common along this stunning route. In Dirang, we can visit the National Yak Research Center’s fascinating farm/ranch and meet the first test-tube yak, among her friends! From Dirang, we’ll head southwest through Bomdilla (market scene here) then into Assam, admiring dramatic scenery with bright chartreuse vistas of rice fields and darker green tea plantations. We’ll board our flat-bottomed riverboat, the MV. 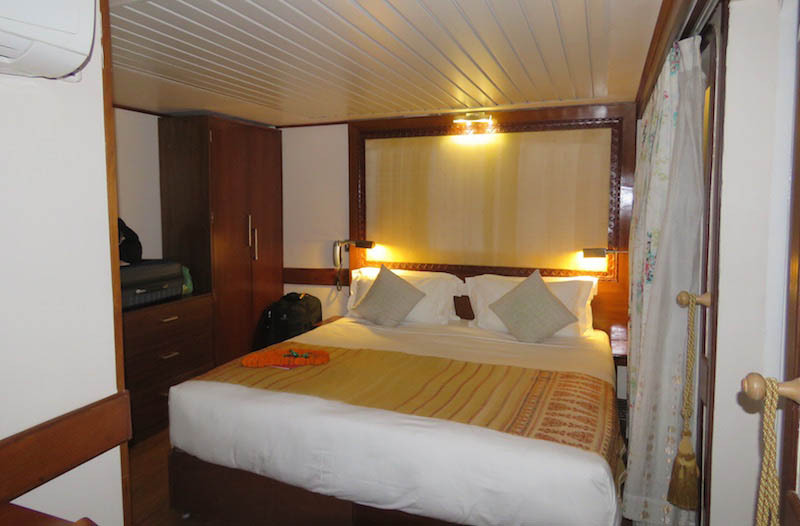 Mahabaahu, for a relaxing journey along the mighty Brahmaputra River. An expert naturalist will be on board with us, offering informal Powerpoint presentations about the culture, fauna and the River environment. The riverboat has an open sundeck, swimming pool (although January may be a bit cold for swimming), excellent cuisine, and pleasant air-conditioned cabins. The staff of chef, cooks, and others is delightful, and the food is delicious. The chef will do a cooking demo if you are interested, and you can visit the engine room of this 4-year old ecologically smart, modern boat. Internet is almost non-existent while we are on the boat, except when we sail by a town and there is slow connection. Each day we moor the boat and go ashore (if you like) in the shuttleboat, to whatever the area has to offer! In Kaziranga National Park where we will take jeep safaris with the naturalist and our guide to see some of the rare One-horned Rhinos and other creatures in the wild. Birds, deer and perhaps some elephants complete the wildlife safari experience. Otherwise, the boat trip is a time to relax, read a book, participate in the early morning yoga class, sketch a rhino, or just dream the day away. Includes 20 nights accommodation (double rooms with private bath) in good modern hotels in cities, and clean local hotels in remote areas. On the riverboat, the luxurious modern cabins are double share (singles subject to availability). All local transportation by 3 excellent, comfortable SUVs with professional, good-natured drivers; luggage stored on top of vehicles, and protected with plastic tarps. Also included are TWO interior flights Delhi to Dibrugarh round-trip (return from Guwahati), comfortable, modern riverboat sojourn down the Brahmaputra, all meals and tea breaks, water/tea/coffee and soft drinks with meals; bottled water on road trips and boat; all village visits and museum entrances as on itinerary; all temple/monastery/nunnery site visits, yak farm visit with yak geneticist guide, land excursions, as on itinerary; airport arrival and departure transport (on group arrival and departure days), Inner Line Permit fee for travel in restricted area of Arunachal Pradesh; professional English-speaking guide from Arunachal Pradesh, and American Cynthia Samaké to accompany entire itinerary– and WOW! a custom travelogue photo book of your trip. Lunch and dinner included on February 5, departure night. Red silk and cotton jacket on loom, Dirang. Not included: International airfare, visa for India (get by applying online from Travisa.com before departure); travel insurance (required, usually available inexpensively when you buy your airline ticket online); alcoholic beverages, personal expenses such as guide and driver *tips and luggage porter tips, laundry, between-meal snacks; internet charges, and camera/video fees if required.